According to consumer surveys, only one out of every five Mexican households decorates a natural Christmas tree during the holiday season; the other 80% of households decorate artificial trees. About 75% of natural trees are bought from traditional retailers, with the remaining 25% purchased from informal street vendors. Almost all purchases of natural Christmas trees are made between 10 December and 25 December. As of mid-December 2014, sales of trees are reported to be down on previous years. Retailers claim that the prices for imported trees (ranging from 330 pesos (about 25 dollars) for a 1-meter-high tree to 1,500 pesos (110 dollars) for a large tree) have led to greatly diminished demand. Prices for domestically grown trees range from about 100 to 1,000 pesos. The total annual demand for natural Christmas trees is about 1.8 million. Mexico currently imports about 1 million trees a year, almost all from the USA and Canada. Annual imports are worth about $12 million. Imports are governed by strict standards, last revised in 2010, to ensure that no unwanted pests or diseases are brought into the country. As of mid-December, at least 5500 trees had failed the health inspection at the border and had been returned to the USA. Officials from Mexico’s Federal Environmental Protection Agency (Procuraduría Federal de Protección al Ambiente, Profepa) identified several problems in shipments of Douglas Fir and Noble Fir trees. At Tijuana, one shipment of Douglas Fir was found to be infected a resin moth (Synanthedon sp. ), and one with flatheaded fir borer (Buprestidae). In Mexicali, a shipment of Douglas Fir was infested with the Douglas-fir Twig Weevil (Cylindrocopturus furnissi), while in Nogales, imported trees were found to be accompanied by unwanted European Paper Wasps (Polistes dominula). None of these pests are normally found in Mexico. Mexicali is the busiest border crossing in terms of Christmas tree imports, accounting for 35% of the total, followed by Tijuana (25%), Nogales (16%), Colombia (15%), Nuevo Laredo (4%), San Luis Río Colorado (3%), Reynosa (1%) and Puente Zaragoza-Isleta (in Chihuahua) (0.4%). 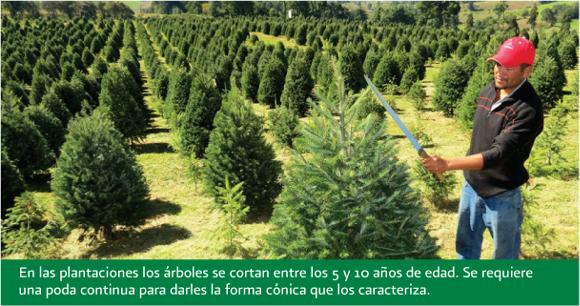 In the 1970s and 1980s, most natural Christmas trees sold in Mexico came from Mexico’s natural forests. Beginning in the 1990s, specialist Christmas tree nurseries and plantations were started. Pruning young Christmas trees in Mexico to ensure they keep a good shape. Credit: CONAFOR. According to the National Forestry Commission (CONAFOR), Mexico has almost 17,000 hectares of land planted in Christmas trees. The area of Christmas trees has increased very rapidly in recent years. This year, CONAFOR has provided some degree of financial assistance to farmers with 4,551 hectares of tree plantations in 18 states. The main areas of Christmas tree plantations are in the interior highlands in the states of Mexico, Veracruz, Nuevo León, Mexico D.F., Puebla, Michoacán, Durango, Coahuila and Guanajuato. These states share temperate climate conditions and are close to the main markets in major cities. The most common species grown in Mexico are Mexican White Pine (Spanish: Pino ayacahuite), Douglas Fir (Abeto douglas), Mexican Pinyon (Pino piñonero), Sacred Fir (Oyamel) and Aleppo Pine (Pino alepo). Trees are harvested at between five and ten years of age. Mature plantations of Christmas trees can generate revenue of between 300,000 pesos and 500,000 pesos ($23,000-$38,000) for each hectare. This means that Christmas tree farming has become a profitable form of sustainable development in some rural communities, offering greater profit potential than using the same land to grow traditional rain-fed crops. The planting of Christmas trees is supported by CONAFOR’s ProArbol program, which offers landowners incentives to conserve, restore, and sustainably exploit forest resources. CONAFOR claims this helps to limit urban sprawl, and counteract forest clearance for arable land, as well as to increase the capture and storage of carbon, thereby mitigating climate change. In addition, conifer plantations generate rural employment, reducing the effects of one of the key “push” factors behind rural-urban migration. Note: This is an updated version of a post that was first published in 2012. USDA Foreign Agricultural Service GAIN report: Mexico: Christmas Trees, by Dulce Flores, Vanessa Salcido, and Adam Branson. 12 May 2011. Mexico’s National Forestry Commission (Comisión Nacional Forestal, Conafor) and the US Forest Service have signed an agreement aimed to ensure more efficient fire-fighting when dealing with wildfires on the border of Sonora/Arizona. The agreement, the Bi-national Convention on Forest Fires (Convenio Binacional de Incendios Forestales) is designed to increase public safety on either side of the border, reduce habitat loss, and facilitate the exchange of information about wildfires, leading to improved preventative measures and firefighter training. The Convention establishes that when a fire is detected in the municipalities of Nogales, Naco, Agua Prieta or Santa Cruz, a united bi-national command can be established to ensure effective collaboration between the two countries’ firefighters. Firefighting brigades, together with supporting vehicles and aircraft, will be authorized to cross the border by up to 16 km (10 miles) in either direction when battling wildfires, provided they give prior notice to the relevant migration, security and customs agencies in the country concerned. In 2013, 99% of wildfires were attributed to “human actions”, with 36% of all fires resulting from deliberate agricultural burn-offs getting out of control. The main wildfire season is from February to May each year. May is the critical month because it marks the end of the dry season in most of Mexico, the time when the natural landscape looks parched. During May, as the landscape waits for the start of the rainy season, precursor electrical storms are relatively common. Electrical storms can easily trigger wildfires if they ignite the tinder-dry vegetation. Following our critique of the Maya Biosana chocolate megaproject (Maya Biosana or Maya Bio-Insana? Chocolate megaproject in Quintana Roo), a project which claimed it would plant four million cacao plants in four years, we have received additional information about developments in the Los Divorciados ejido where the project is based. According to an insider, the project has now completely abandoned its plans for a massive cacao plantation. Jim Walsh, the former CEO of Maya Biosana, left the project in December 2012. Maya Biosana is now being managed by a Mexican firm AMSA (Agroindustrias Unidas de México, S.A. de CV) which is trying to convert the land into a profit-making venture producing corn and other grains. According to recent visitors to Los Divorciados (the ejido in question—see map), this could not be further from the truth. They report that in summer 2013, the Maya Biosana project, which had started out by employing around 200 people, now had 40 workers at most. One member of the group that visited Maya Biosana estimates, “based on the number of motorcyles parked there when we were there”, that the real workforce at Maya Biosana may be even smaller, perhaps 20-25. The 13-minute documentary, “Maya Biosana – The Rebirth of Mexican Cacao, A short documentary,” can still be seen (as of August 2013) via this link on the Intentional Chocolate blog. However, note that many of the images included in the video are most definitely NOT from the Maya Biosana area, or even from Quintana Roo. According to the Intentional Chocolate blog, “The film won the best short Award in 2012 at the Awareness Festival”, a claim it has also proved impossible to verify. The original Maya Biosana is no more, but will the new management of this area by AMSA prove to be any better for the local ejidatarios than the original megaproject fiasco? We certainly hope so, but only time will tell. 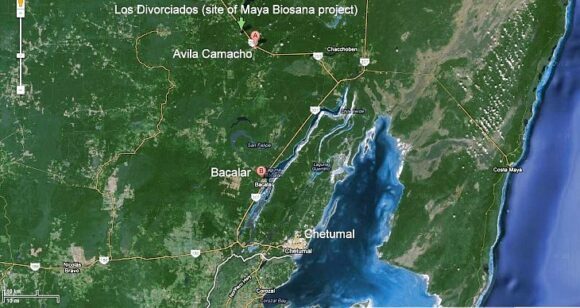 In the interim, we received an e-mail a few weeks ago about a new megaproject underway in Avila Camacho, the next village to Los Divorciados (see map). Apparently, this megaproject is for plantations of exotic trees, which involves deforesting the jungle, extracting the wood, and planting a total of 6000 hectares with White Teak (Gmelina arborea, Spanish common name melina), a tropical hardwood, at the rate of 1000 hectares a year. So far, about 50 hectares have already been planted. The correspondent writes that they “stole the land of the Mayan people, cheating about the pay of rent: the rent is $45US for a hectare for a year. They are destroying the jungle and extracting the wood.” We have been unable to get independent verification of these claims as yet, but will continue attempting to do so. Initially, some equipment from Maya Biosana was utilized on the Avila Camacho project, and our correspondent claims that it is the same Mexican-associated company that is responsible, though we have not yet been able to confirm this. According to a second source, the CEO of this project is Fernando Gonzalez, a “very good friend of Jim Walsh”, the former CEO of Maya Biosana, but there is no longer any direct connection between the two projects. There may have been recent “developments” in this part of Mexico, but they certainly do not yet constitute any form of sustainable development. Is Mexico really one of world’s reforestation success stories? No one doubts the need for reforestation in Mexico. Since colonial times, huge swatches of the country have been denuded of their native vegetation. Recent figures from INEGI suggest that Mexico has lost almost 50% of its native forests due to logging and clearance for farming and settlement. The majority of this loss is in the Volcanic Axis belt that stretches west-east across the center of Mexico at an average height of 3000 m above sea level, but tropical rainforest areas much further south have also been decimated. There is, however, some encouraging news. Data released by the UN Environment Programme (UNEP) puts Mexico in a lofty 4th place worldwide for the number of trees planted since UNEP began its “Billion Trees Campaign” in 2007. According to the UNEP figures, only China, India and Ethiopia have planted more trees than Mexico. The “Billion Trees Campaign, inspired by the work of the late Nobel Peace Prize Laureate Wangari Maathai, recognizes that trees bring multiple benefits to people, ranging from carbon sequestration and the provision of timber to soil erosion control, enhanced aesthetic value and opportunities for recreation. UNEP claims that 12 billion trees have been planted worldwide since the program began. But are the UNEP figures all they appear to be? Certainly, Mexico’s Environment Secretariat has organized, for many years, on-going programs of reforestation and conservation designed to stem the tide of logging that decimated Mexico’s natural forests over the past century. Official figures show that the pace of this effort has accelerated in the past few years. For example, between 2007 and 2011, Mexico’s National Forestry Commission protected, restored or reforested 21,000 square kilometers (8100 sq. mi) across the country, an area equivalent to the state of Hidalgo. The total area reforested in those five years amounts to more than 3500 square kilometers (1350 sq. mi). On the other hand, critics of Mexico’s forestry policies, such as Greenpeace claim that up to 70% of all lumber sold in Mexico has been illegally harvested, and that less than 60% of trees planted in national campaigns survive their first few critical years. One of the most critical areas, one where continued deforestation could be a real “game-changer”, is the Monarch Butterfly Biosphere Reserve which straddles the boundary between Michoacán and the state of Mexico. This is where millions of Monarch butterflies arrive each year from as far north as Canada to spend their winter. The butterfly itself is not endangered (there are non-migratory populations in many countries, and a year-round resident population in Mexico) but what assuredly is endangered is the “migratory phenomenon” of the Monarchs. Adequate forest cover at an altitude where winter weather is consistently within a narrow temperature band is absolutely crucial to the survival of this spectacular annual migration. According to the National University (UNAM)’s Environmental Geography Research Center, at current rates of deforestation, the area of overwintering sites for the Monarch butterflies could be reduced by 75% in the next 18 years, leaving just 12,000 ha of suitable habitat. The protected area, established in 2000, covers 560 square kilometers (56,000 ha. or 216 sq. mi) but includes land cleared for pasture, settlement and cultivation. Researcher José López García claims the reserve is losing 3% of its forest each year. He blames clearance and changes of land use more than illegal logging. The rate of forest clearance has been exacerbated by a rapid rise in the population of the El Rosario ejido. El Rosario is the gateway to the most-visited part of the reserve, attracting thousands of tourists annually. The ejido’s population rose by an average of 5.65%/year between 2005 and 2010. How will climate change affect Mexico’s forests? tropical rainforests (in both Mexico and Brazil) will gradually decline in extent, rainforest soils will have reduced fertility and some parts will become tropical grasslands. Globally, deforestation is believed to account for 17.4% of greenhouse gas emissions, so forest protection and reforestation are key strategies in efforts to mitigate the effects of further cliamte change. 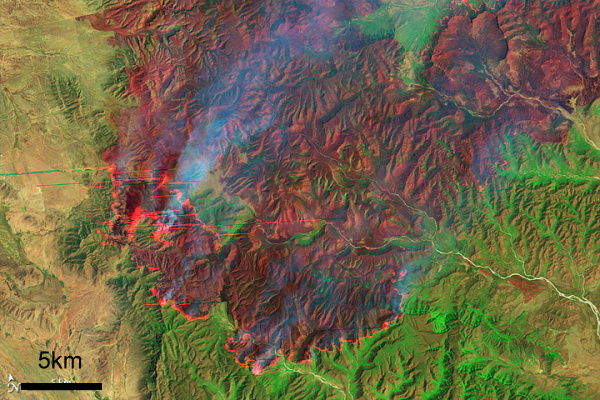 In the past 20 years, wildfires have destroyed 47,000 square kilometers (18,000 sq. mi) in Mexico, equivalent to five times the area of all sections of Mexico City’s Chapultepec Park, the largest urban park in Latin America. The average fire in Mexico affects 32 hectares (80 acres); this figure has not changed significantly in recent years, even though the incidence of fires has increased somewhat due to a combination of climate change and an increase in the number of people living on the margins of forested areas. The National Forestry Commission (Conafor) says that 99% of Mexico’s forest fires are caused by human error, and only 1% are due to natural causes such as lightning strikes. It generally takes about 30 years to rehabilitate forest areas ravaged by fire, with reforestation costing up to $2400/ha. Wildfires are not entirely bad. For example, they help regenerate grassland areas, especially, with fresh young plants. On the other hand, in addition to protecting the existing vegetation, stopping wildfires when they occur helps to preserve soil structure and prevents additional emissions of CO2 from the burning of more plant material. At a national level, it is estimated that fires result in the erosion of 86 million metric tons of soil a year. ii. Central Mexico – Veracruz, Tlaxcala, Puebla, México, Michoacán, Jalisco and the Federal District. This area has more fires than any other because local populations often use fire to clear fields before planting. iii. Baja California. This is the only area where the main fire season is in summer, from March to November. This is the rainy season in the remainder of Mexico, where the fire season corresponds with the winter dry season. The first half of 2011 was an especially bad period for wildfires in Mexico, the worst for at least 30 years. During the first half of 2011, serious wildfires devastated several areas of northern Mexico, with the states of Coahuila and Nuevo León being hardest hit. Other states badly affected included Durango, Chihuahua, Quintana Roo, Oaxaca, Puebla and Guerrero. More than 7,800 fires occurred, severely damaging a total area of 4100 square kilometers. 30 of Mexico’s 32 states were affected; only Tabasco and Baja California Sur escaped unscathed. Conafor’s annual fire-fighting budget for the entire country is only 650 million pesos ($50 million dollars); the average annual area damaged by wildfires is only 2600 square kilometers, of which 500 square kilometers are forest. At the height of the 2011 fire season, more than 60 new fires were being reported each day, according to Conafor. In the state of Coahuila, fires damaged 250 square kilometers in four weeks. It is believed that 50% of these fires were due to farmers losing control of deliberate burns. Farmers are supposed to have an adequate fire-suppression plan in place before setting a deliberate burn, but in practice this requirement is not enforced. The main locations were La Sabina and El Bonito. Authorities were very slow to respond. Diana Doan-Crider, a wildlife biologist at Texas A&M University, has spent the past 25 years studying the Mexican black bear in the Serranía del Burro in Coahuila, an ecological corridor that runs parallel to the Eastern Sierra Madre. The area includes a large population of Mexican black bears. Doan-Crider claims that authorities completely ignored the first warnings and that their eventual response (two weeks after the first fires started) lacked adequate coordination. Many mother bears and their young cubs perished in the fires. In the neighboring state of Nuevo León, large swathes of ranching land were ravaged by fire. One rancher who lost more than 10,000 ha of cattleland was equally critical of the slow response time of firefighters who took more than two weeks to appear on the scene, by which time the fires had taken hold. David Garza Lagüera had converted his 14,000 ha ranch into the Cumbres de Monterrey National Park, one of the key areas of bear habitat. The largest pines on his land were more than 150 years old. All were totally destroyed. The worst damage was in Galeana, Montemorelos, Zaragoza, Aramberri and Mina. The area burned in Nuevo León in May 2011 was almost ten times the total area affected in the state for the whole of 2010. Why was the 2011 fire season so bad? Ironically, the passage of Hurricane Alex in July 2010, which brought 1500 mm (60″) of rain to the Serranía del Burro, actually worsened the fire damage the following year. The rain from Hurricane Alex encouraged so much new growth in the final months of the rainy season that when it died back in the dry season, there was far more fuel available than usual for any wildfire that was sparked. By the time the federal government declared a state of emergency, it was too late; the fires had already destroyed large areas of grassland, scrubland and forest. The emergency response when it finally arrived included help from the USA and Canada such as the specialist aerial Mars water-bombers stationed on Vancouver Island. The fires were only fully extinguished once the annual rainy season arrived. A coniferous tree plantation is being formed on the lower slopes of Ajusco, the 3,930 m (12,894 ft) volcanic peak that overlooks the southern part of Mexico City. After decades of uncontrolled land clearance, local farmers are replanting 800,000 trees as part of a sustainable project which will ensure them a reliable income for years to come. 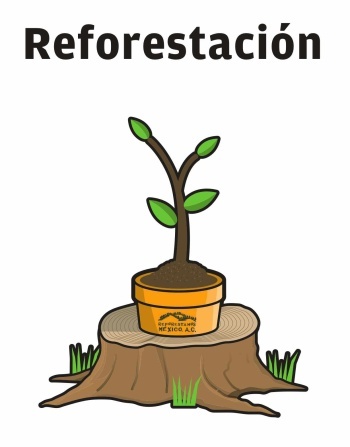 Mexico’s National Forest Commission estimates that mature coniferous plantations are highly profitable, and should repay farmers a 500% return on their investment. Individual trees have to be at least 8 years old before they can be harvested. Three species of conifers are being planted: the Sacred Fir (oyamel), Douglas Fir and Mexican White Pine (ayacahuite). At present, only about one-third of Christmas trees sold in Mexico are natural trees, with 60% of these having to be imported from as far away as Canada. The project will not only increase farmers’ incomes, it will also reduce soil erosion, increase carbon storage, and bring hydrological benefits. Mexico City has seriously depleted its aquifers – see Why are some parts of Mexico City sinking into the old lakebed? Reforesting the hills surrounding the city means more water will be retained in the soil, and less will runoff into the city’s already-stressed network of storm drains. Ajusco is not the only volcanic peak near Mexico City where deforestation has become a major issue. In August 2011, National Water Commission (Conagua) officials blamed serious flooding in the Rayón municipality of the State of México on the uncontrolled logging of the lower slopes of the Nevada de Toluca volcano. The lack of protective forest cover meant that heavy rain caused the River Santiaguito to burst its banks and flood homes in the community of San Juan La Isla. The situation would have been far worse if Conagua had not ordered the dredging of 12,000 cubic meters along a 4 km stretch of the river bed in 2009. Following the 2011 floods, Conagua reiterated the need for more reforestation and called for stricter land use controls to prevent similar problems in the future. 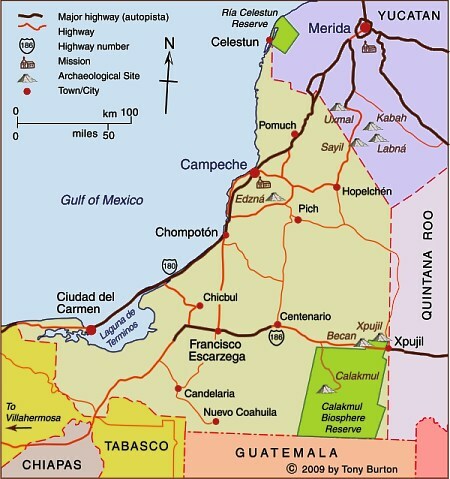 The state of Campeche (see map) has an area of 57,925 square kilometers and a population of 608,535 (2010 estimate). Its distinctive landscapes include a variety of coastal features and inland karst (limestone scenery). The state’s capital city is Campeche, a colonial city which still preserves some of its ancient city walls and has UNESCO World Heritage status. The most important city in the state economically is Ciudad del Carmen “the pearl of the Gulf”, center of the state’s involvement in Mexico’s oil industry, and an important base for offshore drilling. Map of Campeche. Copyright 2009 Tony Burton. All rights reserved. In the interior, the biosphere reserve of Calakmul has become an important tourist attraction. The state’s economy looks set for a significant boost in coming decades as several major projects come to fruition. These include the first 6,000 hectares of a 30,000-hectare project on the coast of the Laguna de Términos for the commercial farming of rice and beans, and a similar sized forestry plantation project near Champoton specializing in the growing of scarce tropical hardwoods such as teak and mahogany.